As I approach my middle age and experience the maturing of my body I think I recognize the source of Mother Nature’s erratic weather patterns: she’s is menopausal! Rain? In January? Did she forget where we live? This isn’t the rainy season. It’s supposed to be the SNOWY season! Mother Nature needs hormone therapy, STAT!!! 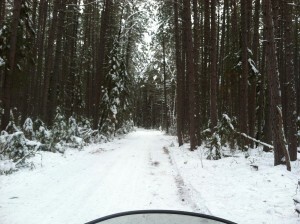 Needless to say the rain that we experienced at the end of last week has pretty much ruined the snowmobile trails. 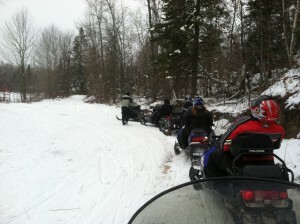 We snowmobiled three times last week and even though we are too old for that (Ibuprofen, anyone?!) we are so happy that we did! More than an inch of rain fell on our area turning roads and low-lying areas into ponds. There was some hope on Friday that we might get a dumping of snow afterward but, no….it didn’t happen. Trail conditions were marginal before the rain so right now I would say leave the snowmobiles at home unless you plan to ride your sled out to to your ice house. The good news is that we have got plenty of ice! Reports from guests last weekend indicated more than 12″ of ice on the south end of Bass Lake. Although I haven’t seen any trucks out on the ice as of yet I’m sure by the weekend we’ll see some bigger vehicles out Bass Lake. Info courtesy of VisitGrandRapids.com calendar of events. January 19: John Anderson, 7:30p @ Reif Performing Arts Center. January 22: The Gichigami Trio, 7:30p @ Reif Performing Arts Center. January 25: Mountain Heart, 7:30p @ Reif Performing Arts Center. January 26: Candy Cup#1 (2:30pm); cross country ski race for 4-14 years old; entry fee only $5; hosted by Mt.Itasca Nordic Ski Association (MINSA). For more info go to: www.MtItasca.com or call Petra C. at 218-999-5046. January 26: Jenny Guyer Ice Fishing Tournament, 11a-3p @ Trout Lake, Coleraine. $5 entry fee. Concessions, raffle, silent & live auction items @ Coleraine Fire Hall. Ready to head for home after a little break to chat and stretch. 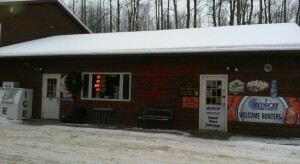 Antler Lake Store is a favorite stop when we’re out on the snowmobile trails!